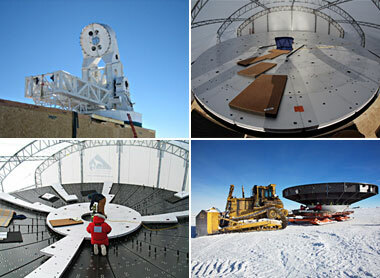 The South Pole Telescope is a huge undertaking! More than thirty scientists and engineers make up the team to build and operate this enormous instrument, and many more people are involved in supporting the effort at the South Pole Station. Building this telescope in one of the most extreme locations on the planet has posed unique challenges. Why go to all this trouble? What do we hope to learn? What kinds of things are in the Universe? How has the Universe changed as it aged? Can we understand or make "models" that describe how the Universe as a whole works? Can we say anything about how the Universe will look in the future? The SPT is one of many powerful instruments being used to address these questions. It is reasonable to ask whether any measurements we can do here on Earth will have much bearing on such questions. After all, where would you start? Remarkably, the Universe has properties and "fossils" in it that can help us learn about its history, age and development as a whole. The familiar "Big Bang" model makes concrete predictions for measurable phenomena, allowing the model to be experimentally tested. So far the Big Bang model has passed all the tests. Perhaps more importantly, the Big Bang model unifies a diverse set of measurements and observations into a single picture for how the Universe began and how it has evolved. While the core concepts of the Big Bang picture are on very solid footing, observations have also uncovered mysterious features of the Universe that are not yet understood. One outstanding question is the fundamental question of what makes up the Universe. We all know about matter: we, the earth, the sun and all the stars are made up of matter. However, observations of the Cosmic Microwave Background (CMB) and careful measurements of the distances of certain kinds of supernova explosions both give evidence (agreeing with each other in a most surprising and pleasing way) that matter is only about 4% of what makes up the Universe. These measurements and others indicate that we need not just one, but two other major components in the cosmic inventory. We have called them Dark Matter (DM) and Dark Energy (DE), because they are not visible directly to our observations. These things are needed in the model because without them, we cannot explain the measured properties of the CMB, supernovae, or other features of the observable Universe. Of these two new constituents, the Dark Energy is the most mysterious. One of the first goals of the SPT is to try to confirm the existence of the Dark Energy and find out something about its properties. Dark Energy pushes things that are very far apart even further apart - opposite to the usual force of gravity that pulls things together. If this mysterious phenomena exisits it will have an effect on how the biggest things in the universe, clusters of galaxies, grow with time. The first set of measurements the SPT will undertake is to make an accounting of the number and sizes of galaxy clusters as the universe ages. The telescope will use the fact that the clusters affect the CMB a little bit as it passes through the gas in the cluster. This distortion of the CMB by the hot gas in galax was first proposed by two Russian Astrophysicists, Yakov Zel'dovich and Rashid Sunyaev in the '60s, so the effect was named the Sunyev-Zel'dovich effect. Making a careful map of the CMB over a big region of the sky allows us to find all the clusters and determine their sizes individually. The number of clusters we will find could be as many as 50,000 or as few as 5,000. The SPT is designed to make a map of the CMB to look for galaxy clusters. The South Pole Telescope is quite different from these optical telescopes that look at the usual visible light. It observes light with a wavelength longer than that of infrared light but shorter than the wavelength of radio waves. The CMB arrives at the earth from all directions having traveled for billions of years through space since its birth in the early universe. To observe the CMB light we need a very clear atmosphere, without much water vapor which absorbs this light. This is the primary reason the telescope is situated at the South Pole [more]. The questions that we try to answer with this South Pole Telescope are big questions about the universe as a whole, rather than questions about the stars, galaxies, or other objects that make up the universe. Galaxy clusters are regions in the universe where the density of matter is much higher than the average density. When you look at an image (like a Hubble Space Telescope image) of a galaxy cluster in optical wavelengths, the cluster looks like an association of a number of separate but distinct galaxies. 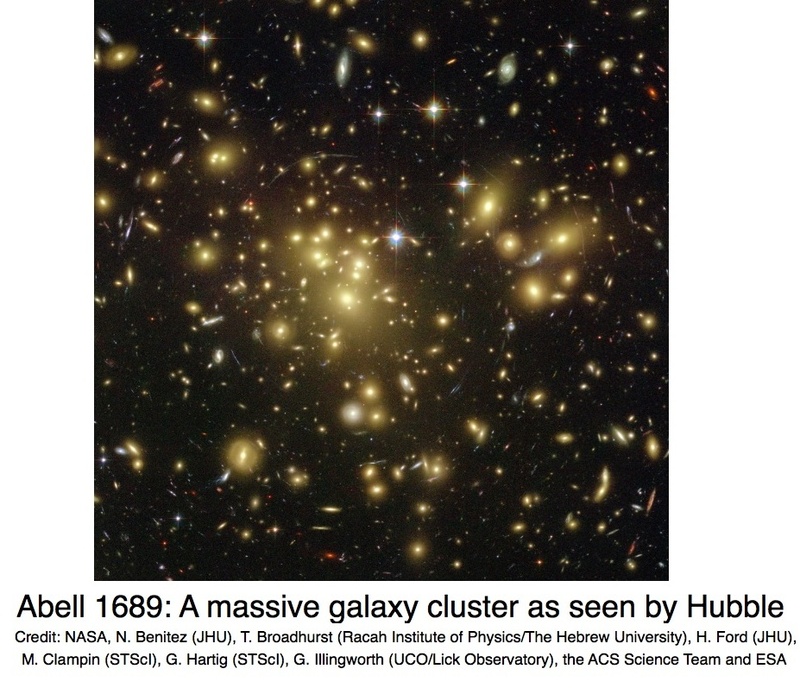 When these clusters were first discovered and studied, the term "galaxy cluster" was a simple description of what the observers saw in their images. However the name "galaxy cluster" hides the fact that clusters are gravitationally bound, distinct objects. Most of the ordinary matter in a galaxy cluster is not found in the galaxies but is more diffuse, hot gas. Most of the total mass of the cluster is not even ordinary matter as we know it but is dark matter, which is a type of matter that does not emit light but does interact through gravity. What can studying galaxy clusters tell us about Dark Energy? Galaxy clusters are the largest gravitationally bound objects in the universe. They are also the youngest class of objects, as it has taken the age of the universe for them to gather all their mass. During the epoch of cluster formation, a mysterious component of the universe known as Dark Energy appears to have played an important role in the universe. Dark energy inhibits the growth of galaxy clusters over time. If we can trace out how many large-mass clusters have formed throughout different periods in the history of the universe, we can probe the tug-of-war between gravity (through which matter clumps together) and dark energy (which impedes cluster formation by causing space to expand more rapidly). This is one way that we can learn more about the role that dark energy has played. Observations support a hot big bang model for the origin of the universe, in which the universe started out extremely hot and dense and expanded and cooled over time. In the very early universe, the temperatures and densities at any place in the universe were so high that ordinary matter as we know it just could not exist. The universe was a soup of particles and high-energy (short wavelength) light. As the universe expanded and cooled, atoms were able to form out of the particles, and the light was able to escape from the particle soup and travel freely through space. As the universe expanded and cooled even more, the wavelength of this light was stretched out so that what was once the high-energy "glow" from the hot early universe became the Cosmic Microwave Background - a background radiation everywhere in the universe that is characterized by relatively long wavelengths of around a millimeter. A telescope sensitive to millimeter-wave light will see the CMB in every direction from the earth, and the slight variations in the intensity of the CMB light encode valuable information about what the universe was like back when it was a hot soup of particles and radiation. What is the Sunyaev Zel'dovich Effect? The light that makes up the Cosmic Microwave Background has traveled through space for billions of years before reaching our telescopes on Earth. Most of that light has traveled freely through empty space, without being scattered by intervening matter. However, when CMB light travels through the dense interior of a galaxy cluster, a tiny fraction (1%) of the light may collide with electrons in the hot gas in the cluster's core. The fast-moving electrons can transfer energy to the CMB. Some small amount of the CMB light that has passed through a cluster has had its energy boosted through this effect (called the Sunyaev-Zel'dovich effect) and therefore has higher energy (and shorter wavelength) than the rest. If we observe the CMB in a part of the sky using a telescope sensitive to longer wavelength CMB light, we will see the effect of clusters on the CMB sky through the appearance of little "holes" where clusters are. Because we filter out the short-wavelength light, and restrict ourselves to long wavelengths, we no longer see the photons that have passed through the clusters. Instead, we see holes in the background light where the clusters are. Thus we can locate galaxy clusters by finding "holes" in the cosmic microwave background. Why use the SZ Effect to detect clusters? In order to study the population of clusters throughout cosmic time, we need to conduct large surveys to find many galaxy clusters. No single technique is perfect, and the best approach is to use many different techniques to find and study galaxy clusters. One key advantage to using the Sunyaev-Zel'dovich effect is that it allows us to look for galaxy clusters that are very very distant (and therefore formed very early in the universe). While distant clusters would be too faint for optical surveys to find, the distortions that they cause in the CMB are no different than those caused by nearby clusters, and the SPT will be able to detect them in the same way. 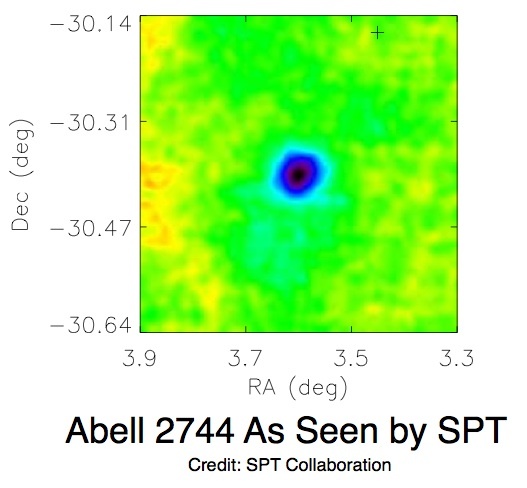 The SPT will be able to look back to when the very first large clusters formed. Additionally, the degree to which the CMB light is affected by a given cluster depends on how massive that cluster is, because a more massive cluster has more hot gas to scatter CMB light. The Sunyaev-Zel'dovich effect therefore leads to a measurement of the mass of each cluster that we observe. This is an important quantity to trace over cosmic history, because the rate at which massive clusters form is sensitive to Dark Energy.